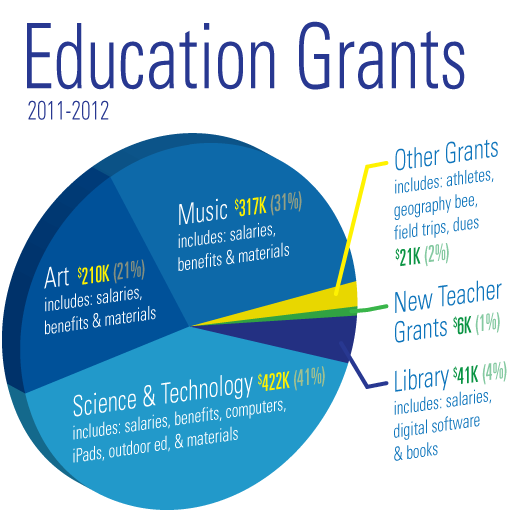 SPARK supports a quality, well-rounded education by funding music, art, science, technology and library services for all 1,420 students at Neil Cummins and Hall and works in partnership with the Larkspur-Corte Madera School District, site-based organizations and the community to enrich the educational experience of all students in the District by raising $1.2 million for the 2011-2012 school year. We’ve outlined below revenue sources and budget plans from the 2011-2012 school year. During the fiscal year 2011-2012 which ran from July 1 to June 30th, SPARK’s primary’s fundraising vehicle was the Annual Giving Campaign, which made up 66% ($826K) of the total dollars raised by SPARK and kicked off in the Fall with a back-to-school brochure mailing and Donation Day drive and culminated with a Spring reminder. Thanks to generous local and family business supporters, SPARK Biz generated 5% (57K). The foundation held three fundraising events in 2011-2012: the Golf Tournament in October, the Fashion Show in March, and the Spring Auction in May together raised 27% (332K) of the revenue. And finally, the eScrip program generated 2% (29K). All of the Larkspur-Corte Madera School District’s music, art, science and technology teachers were paid through SPARK contributions. This included 3 art teachers, 3 music teachers, 3 science/tech specialists and 1 library aide. SPARK also pays for materials and supplies for these programs which includes all of the technology equipment District-wide, additional services and programs for Library, Outdoor Ed, Mathletes and teacher mini grants. 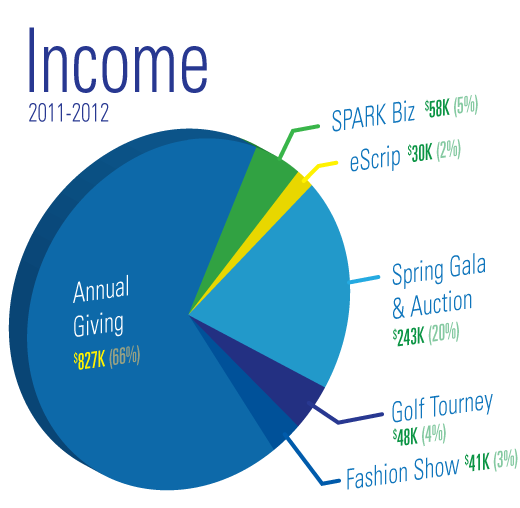 Want a deeper look at SPARK’s financials for 2011-2012? For financial information on previous years, click here.